What a great weekend! On Friday, the incomparable Alison Morris (the children's book buyer at Wellesley Booksmith in Massachusetts) gave me a shout out on her Publisher's Weekly blog, Shelftalker. On Saturday, I threw a fabulous Halloween party for my son and his friends. And yesterday, I found a hummingbird nest. Doesn't get much better than that! Or does it? Last week, I scored this in a junk shop for $1.99... and it was such a great deal that I couldn't pass it up... except we have all the books in here already... so there is only one thing to do with it, and that's give it away! 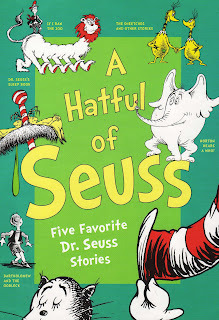 This week's Great Monday Give is a practically perfect hard copy of A Hatful of Seuss, a collection of the great Doctor's work including the classics If I Ran the Zoo, Sneetches and Other Stories, Dr. Seuss's Sleep Book, Horton Hears a Who! and Bartholomew and the Oobleck. A wonderful collection... Bartholomew and the Oobleck is one of my all time favorite Seuss books... and it can be yours (maybe) if you comment on this post between now and midnight Sunday, November 8. A winner will be selected at random and announced the following morning. In case you were wondering who the winner of last week's give is... that delightful wee copy of Golden Guide: Birds? Skye from right down the road in Austin. Congrats sister and send me your info as soon as you can to webe(at)soon(dot)com. Stay turned for a review later in the morning and all you Dr. Goat fans... know that I have a very very very special treat coming up later this week. That's it for now kids! You know, if I still lived in SA, there would be a high probability I would be stalking you so I could figure out where you find all of your wonderful treasures! LOL! I think this book would be a great addition to our home library. ;) Fingers crossed! This would be great to add to our library! Thanks for the chance. My hubby is our resident Dr. Seuss reader around here--he does such a good job of it. I know he'd love to add this one to our collection. I am flattered beyond measure to have been called "incomparable"! Thank you! I am also mortified, though, that in my late-night-blogging state I got the name of your blog wrong. (How embarrassing...) I've corrected that shameful mistake and in so doing am hopefully a bit closer to living up to your compliment. Thanks again! As for entering the contest in today's post, please don't put my name in the mix. Someone who gets fewer free books than I do should reap those benefits! We would absolutely love to win this book. Thanks for the awesome giveaways. On Beyond Z is my current Dr. Seuss favorite. Dr. Seuss is one of those authors that continues to open new realms for me. Another excellent find! My son would love this set of stories. So, I've got to try for it! Thanks! Dr. Seuss is my all-time favorite. My aunt used to read "The Sleep Book" to us every time we slept at her house. Yay for Seuss! Definitely would love that one. Thanks! My daughter is in love with the Dr. Seuss Foot Book right now. We'd love this one! Thank you! I would love to share these with my son. We don't have all of these. Wow - we don't have any of these! My daughter loves dr. seuss and doesnt have this(these ones). My boys love Dr. Seuss books, but we only have Ten Apples Up On Top, so the rest we always have to get from the library. I know they would love this! Dr Seuss books are my all-time faves...and my children just love them, too! How fun it is to read books to your children that you grew up with yourself...I feel like I'm sharing part of my childhood with them. OH!!! P-L-E-A-S-E pick me... Oh!!! I would L-O-V-E to win these!!! sigh... and fast beating heart, too... Hope you are well. Hoe fun! would LOVE to add these to our bed time (or anytime :) book shelf! thanks for the opportunity. Bartholomew is my favorite, too. I'd love to have these. Thanks! Entering, too. I need more Suess! The book looks great. My little one loves Dr Seuss, but we've never read some of these stories! Hooray for Seuss! We love his stuff... but then again, who doesn't? My sons love Dr. Suess! Fabulous giveaway! Pleas enter me!!! Please enter me in this giveaway! I love Dr. Seuss! I would love to have this collection. It brings back wonderful childhood memories. Oh I would love a copy of this one.